Whether our residents moved from just down the street, elsewhere in Lehigh Valley or New Jersey, we are amazed at how many already know each other. 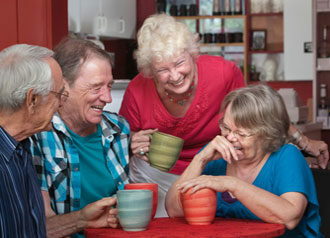 And each of them (and their families) tells us how moving to Country Meadows has made for more worry-free, comfortable living, affording time to really enjoy their retirement years meeting new neighbors or reacquainting with former ones. Isn’t that what retirement living should be about? We understand choosing among retirement communities is a big decision and have guided many families in helping them choose what is best for them. We believe after making the decision, the next steps should be less overwhelming and as smooth as possible. We are ready to help you and your family identify any necessary financial resources and the transition. We are an all-rental community with one all-inclusive monthly bill and no large upfront fees. Apartment availability varies in each level of service, but we work with families to find the best option and fit per their preferences. Schedule a visit for any day of the week to discuss what you are looking for and see what we have to offer you. Helping you with your decision. In working with families, we find many are not familiar with their own daily, monthly and yearly living expenses when evaluating the difference between staying at home or moving to a senior retirement community. We understand and have created a helpful tool to compare current household living expenses to living at Country Meadows.